Mid Penn Bank provides commercial real estate lending services for individual borrowers, developers and investors. 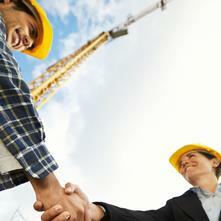 We also offer financing for construction of many different commercial property types. The reality is that commercial real estate development comes with unique challenges, risks and rewards. When you’re building a hotel, shopping complex, residential area, or other commercial project, you need a valuable banking partner to understand the scope of your project and provide the best financing solutions. Our commercial real estate loans are made by local lenders who understand the region and our clients’ needs. Additionally, Mid Penn Bank supports growing businesses that are seeking construction financing. You can be certain that our team of experts will provide financing at competitive rates, and most importantly, funding to carry you through the project’s completion. To get started, set up an appointment with one of our Commercial Real Estate Loan Officers today.